MTV World Stage Live In Malaysia marks its SIXTH YEAR! Save the date, reshuffle your appointments and start planning your trip to Sunway Resort City, Kuala Lumpur, because it is the place to be – come August! MTV, a unit of Viacom Inc, has officially announced that MTV World Stage Malaysia is back for the sixth-year running. 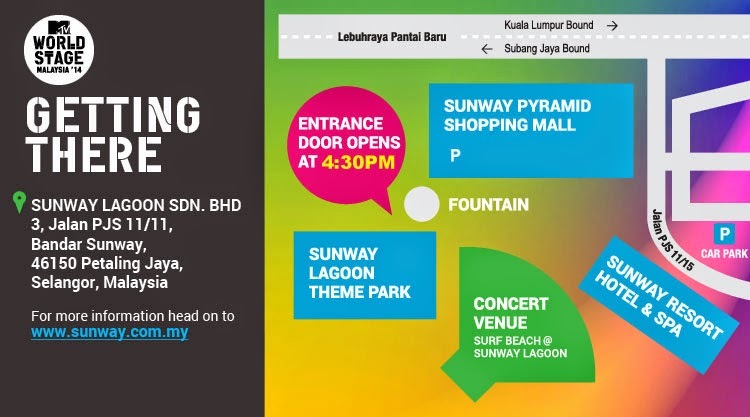 Recorded live for global telecast, the one-night-only outdoor concert is set to take place at Surf Beach, Sunway Lagoon on Saturday, 16 August 2014. MTV Asia also announced award-winning Billboard Hot 100 hip hop artist, singer-songwriter and record producer, B.o.B to its line-up of performers for MTV World Stage Malaysia 2014. The show, which will mark its 6th year in Malaysia, currently includes homegrown international singer-songwriter, Yuna; and Universal Music Group International’s first K-pop idol group, Boys Republic. MTV VJs Alan and Hanli will again be hosting this year’s concert. All recording devices (cameras, videocams, tablets, laptops); but smartphones allowed. Dangerous objects (e.g. 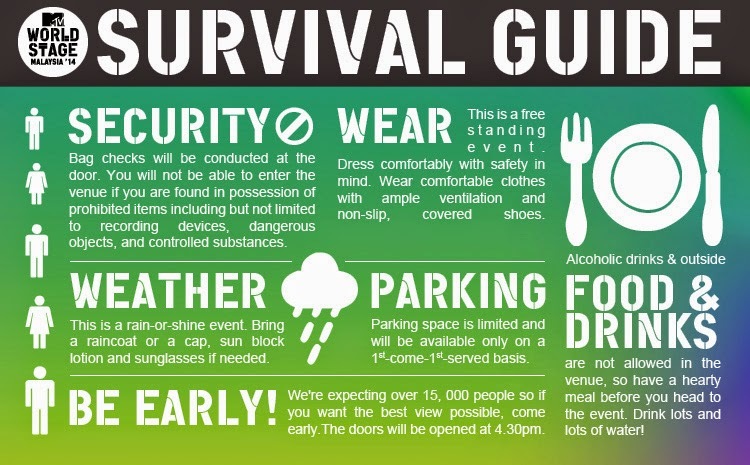 helmets, umbrellas, sharp objects, or as determined by MTV); but short umbrellas allowed. Drugs and other illegal substances are strictly prohibited. Violators will be referred to the authorities. Sunway Lagoon is truly one of a kind. Step inside and you'll discover a magical kingdom of pure fun and excitement. Experience the wonders of over 80 rides and attractions spread across its 5 parks - Water Park, Amusement Park, Extreme Park, Wildlife Park and Scream Park. True to its ‘Asia's Best Attraction' fame, the multi-park is also home to the World's First Waterplexx 5D and also World's Largest Water Ride - Vuvuzela, its latest attraction to date. Open daily from 10.00am to 6.00pm, other worthy attractions include the World's Largest Man-Made Sandy Surf Beach, Malaysia's First Interactive Zoo, Asia's Longest Flying Fox Trail, Lynton V Harris' Scream Park – a live interactive ‘scare' attraction and one of the Longest Pedestrian Suspension Bridges in Malaysia. Xpax is Celcom Axiata Berhad's main prepaid brand, representing more than half of Celcom's 10.2 million prepaid subscribers. Xpax offers the best value with freebies of up to 30 calls and 10 hours of Facebook every day. Xpax members only need to make 3 domestic calls to enjoy these fantastic freebies every-day, all-day, all- night. Hong Leong Bank Berhad is one of the leading financial services organisations in Malaysia. With a heritage of more than 100 years, it provides comprehensive financial services covering consumer banking, business banking and trade finance, treasury, branch and transaction banking, wealth management, private banking and Islamic financial services. Its merger with EON Bank Group in 2011 has further embedded its position as a core banking franchise with an expanded distribution network of more than 300 branches across the country. With a proven track record in value creation and a highly recognised brand, Hong Leong Bank has also been extending its footprint in the region, with branches in Singapore and Hong Kong and a wholly owned subsidiary in Vietnam and Cambodia. In China, the Bank has a 20% shareholding in Bank of Chengdu Co., Ltd., Sichuan and a consumer finance joint venture. Hong Leong Bank is a subsidiary of Hong Leong Financial Group Berhad, the financial services arm of the Hong Leong Group. Apart from banking, Hong Leong Financial Group is involved in the provision of insurance and takaful, as well as investment banking, unit trust, fund management and stock broking services. Tourism Malaysia is an agency under the Ministry of Tourism & Culture, Malaysia. Tourism Malaysia focuses on the specific task of promoting Malaysia at all levels. Since its inception, Tourism Malaysia has grown by leaps and bounds and it has emerged as a major player in the international tourism scene. In 2012, Malaysia registered 25 million tourist arrivals and RM60.6 billion in tourist receipts, placing the country firmly as the 10th most popular tourism destination in the world. In 2014, Malaysia celebrates its fourth VISIT MALAYSIA YEAR (VMY) with the theme “Celebrating 1Malaysia Truly Asia”. The VMY 2014 promotional campaign has started this year with a series of year-long special events and activities leading to VMY 2014. It will contribute to the Government’s target to receive 36 million tourist arrivals and RM168 billion in receipts by 2020, as outlined in the Malaysia Tourism Transformation Plan (MTTP) 2020.